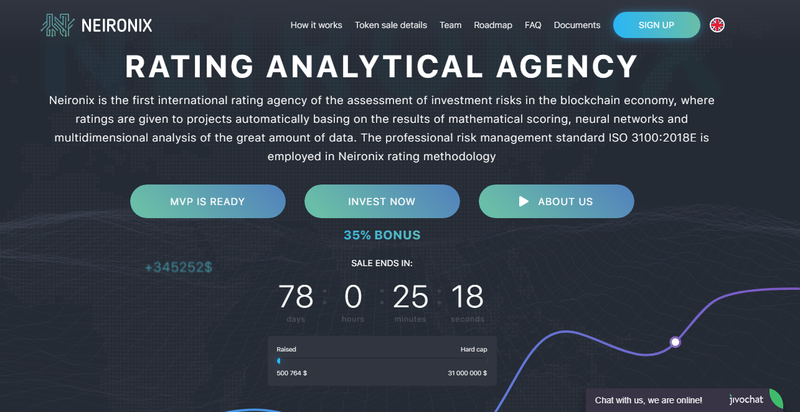 Neironix is ​​the first independent international rating agency for assessing investment risks in the block economy, where project ratings are automatically assigned based on the results of mathematical scoring, neural networks, and multidimensional analysis of a large amount of data.The platform is designed to analyze and subsequently manage the risks of investments in projects with a high degree of uncertainty. The Neironix rating methodology is based on the principles of the international risk management standard ISO31000: 2018 (E) and applies similar approaches to risk assessment for professional investors and institutional funds from the classical economy. On Today the ISO31000: 2018 (E) standard is adapted in 88 countries with the highest GDP level and is a guide to risk management, including proposing options for influencing risk at different stages of its impact: https://www.iso.org. Protect Neironix, as a global aggregator of financial analytics for cryptocurrency markets, it allows accumulation and classification of the aggregate information into risk factors, which are interpreted for the subsequent use of scoring for ICO and blockchain projects. The advantage makes Neironix stand out. Neironix uses a set of tools — flows of content and information necessary to select ICO projects for investment. Neironix’s objects are private and professional investors as well as ICO projects. 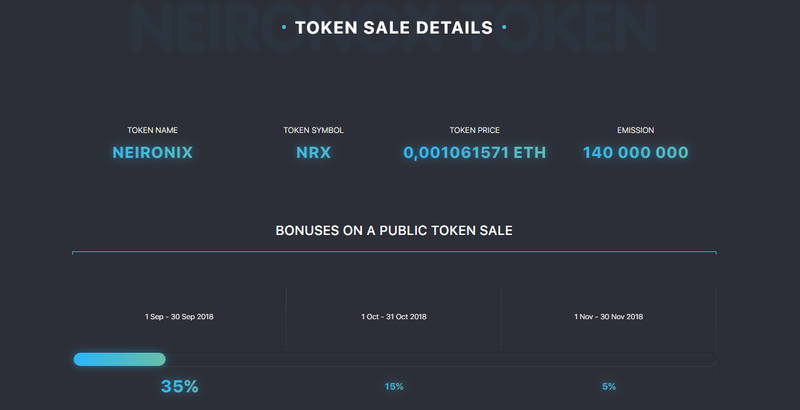 NRX utility token is used in the NEIRONIX ecosystem as a payment medium — the project’s internal currency is required for purchasing each and every service of advertising and informational nature. 3.Publication of press releases and announcements. NRX is a utility token that offers the right of placing advertising and informational services at the price set before at the stage of Token Sale procedure. NRX token is a liquid asset from the very first day of its emission. Growth in demand for Neironix platform services. Deflation, burning away 100% of tokens accepted as payment in the conditions of limited emission. Formation of the idea of ​​the project. Market analysis, project development prospects, goals and mission of the project, financial model of the project; Development of a methodology for defining and managing investment risks in ICO and block projects; Drawing up the first version of the risk tree and scoring matrices. Consultations with qualified and institutional investors; Design of the main product modules and design of databases; Preparation of the first version of the White Paper project. Legal architecture; Approval of the stages of the project, functional, evaluation of resources; Development of automated algorithms for ICO project analysis; Integration with sources of necessary analytics; Involvement of the first venture investments in the project; Launch MVP with ICO listing; Connecting the first exchanges and funds to the project; Alpha testing of scoring matrices and mechanisms for building ratings; Identification of risk factors and the accumulation of historical data; Continuous monitoring of identified risk factors, analysis and identification of statistical dependencies. Development of marketing strategy; Development of a Smart Contract; Implementation of the legal structure of the project; Development of a private office ICO; Connecting the necessary data sources, aggregation and accumulation; Development and implementation of OLTP-architecture, interpretation and analysis of accumulated data. Conducting Pre Sale; Updating the data, checking the history; Aggregation and accumulation of historical data; Launch a mobile application on iOS and Android; Development of the concept of aggregation of data on financial markets; Development and implementation of OLTP-architecture, interpretation and analysis of accumulated data; Launch of the module “Multifactor scoring of ICO-projects”, assignment of the first ratings; Testing of the logical-mathematical and process cluster of the system. Token Sale; Scaling competencies, HR; Running a financial model; International project localization; Conclusion of agreements with data providers and exchanges; Running affiliate programs. Scaling of the project geography (opening of representative offices: USA, South Korea, Japan); Expansion of the product line. Scaling of the project geography (opening of representative offices: South Korea, Japan). Founder, CTO The founder of digital-agency Gold Carrot. Experience in the digital sphere — more than 7 years. There are more than 200 projects in agency portfolio. The creator of a platform for project management. The creator of exchange contacts project sample.me. Co-founder, One of the founders of Neironix. Have 18 years of experience in the banking sphere, 12 of which are at the leading positions of the federal banks. Great experience in attraction of investments and classic business lending. CMO, My experience in digital marketing exceeds 4 years. My major professional competencies include project management, team leadership, task setting with a focus on the high performance of marketing campaigns and maintaining the defined timelines.